Marti released an image of the next character - Gordon. Jenny was released yesterday in the offline version of hero fighter. 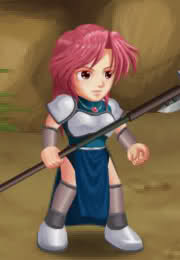 Jenny is skilled in using the spear, and is proficient in both attack and defence. Similar to Lucas, she has a wind blade attack that allows her attack range to be extended. Her whirlwind shield is effective in attacking multiple opponents simultaneously. Controlled properly, she can deal substantial amounts of damage by linking multiple attacks together. The move list for Jenny can be found here. 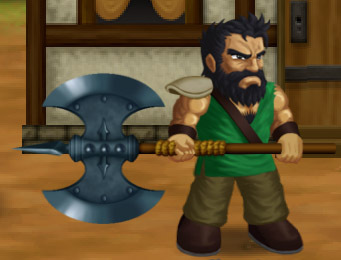 Marti just made an update - some bugs are fixed, AI improved, a new background and a few features were added. Click here to see all updates. He also told me there'll be more female characters this time - but male characters will be the majority. And he also gave me a picture that I can publish together with this info - look yourself - it's awesome! Today marks the first playable release of Hero Fighter, namely Hero Fighter v0.1. Check it out at http://www.herofighter.com/ (opens in new window). As with LF2, Hero Fighter still holds many secrets yet to be discovered, even at this early stage. So, get out there and have fun. p/s: character profiles will be updated with the movelist in the near future, in the meantime, feel free to email us regarding any unlisted inputs if you want them put up.